Janice Graham & Company, P.C. is a full service, certified public accounting firm providing services to businesses, individuals, estates, trusts and not-for-profit organizations. In addition to tax planning and preparation, the firm performs audits, reviews and compilations of financial statements, as well a variety of business consulting services, including Quickbooks© implementation and training. 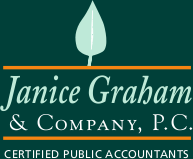 © 2019 Janice Graham & Company, P.C. All rights reserved.